wow, those are really amazing, i didn't know you could also do that kind of non cartoony stuff! Hey thanks Gabriel. Yep, this stuff is from before I did that cartoony stuff that I'm mostly known for. YOU DID THE R.O.F. ALBUM COVER?!?! Bob, are you even aware of how LEGENDARY that song is in the hip-hop community? Jesus Christ! Yeah, I had an idea. I'm only sorry I didn't do more album covers. Is Tommy Boy still around? 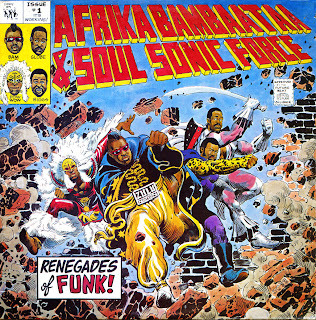 I love the Afrika Bambaataa! Great to see you in blog form! Hey Bob! Good to see you blogging! Back cover on this one sez lettering's by Pete! Hey Randy! How the hell are you? You have the album? Cool! I'm probably wrong about the letering but that was a hundred years ago. How are you? What's up? Yep, I have the record. I went through an Arthur Baker phase back then. Do you need a scan of the Boy George poster? I can provide, if so. Hey Randy I'll check out the Kirby thing for sure. I don't have the Boy George thing. I'd love to have a jpg! 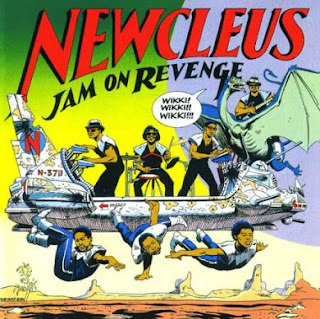 just to fix the record, Patty did Newcleus, I did the Afrika Bambaataa logo. Believe me my hand still aches from working that rapidograph on that sucker! hope paree is treating you awright! just to fix the record, patty did the Newcleus logo, I did the Bambaattaa logo. Hope paree is treating you swell! Yeah, it's a shame that you really don't have those twelve inches of space to work with on a release anymore. Maybe on a remix single, but vinyl is really not a mainstream format anymore. Sad. 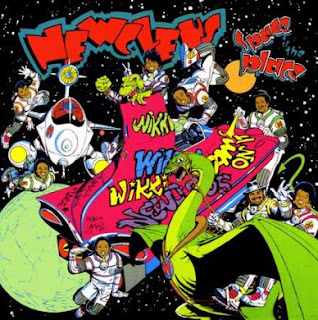 Just got the RENEGADES OF FUNK album. Great work!